great deal of "give and take"
mission program for the year. leadership gathering of the United Jewish Appeal. tcent gathering of Hineni HI in Washington, D.C.
on is Mrs. Samuel Miller. the same donors last year. companies to bid on U.S.
was committed to the Regular Campaign. diaspora partnership at work, he added. 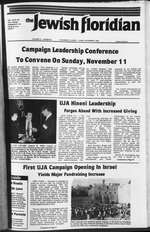 opened the 1985 UJA-communlty campaigns. brought tears to their eyes. has not diminished," she said. been a fringe benefit tor me." Now she works from 8 a.m.
until 4 p.m. two days a week. brunch on the first floor patio. 700 hours of service to the Center by Erwin Blonder [left] and E.
Rabbis at the Sukkot Celebration. "No, I even sing in Hebrew." They can't give into it." elevate their quality of life. the town for the past 30 years. which is located near Giora. from Israeli and American perspectives. government to acquiesce to a final plan. your houses" to the contending parties? niversary of his release from captivity. Jewish experiences in different parts of the country. Pioneer Women Cypress Lakes board 10 a.m.
Temple Judea art auction at Hilton, Singer Island, 7 p.m.
University Women Lake Worth breakfast 10:30 a.m.
Veterans Auxiliary No. 408 board 10:30 a.m.
a.m. Women's American ORT Okeechobec -1:30 PjJ-. Federation General Assembly Meeting 7:30 p.m.
Women's Division Business and Professional CsmP*. Women's American ORT Golden River J08"!^[. Jewish Community Center Executi\e Board *** . refusenik families in Moscow and Leningrad. DISTRICT 1 PD. POL ADV. There will be a book review by Estelle Plaskon. Clubhouse, 554 NE 22nd Ave., just west of U.S. 1. Auditorium Tuesday, Nov. 6,9 a.m. to 4 p.m.
novelty items, plants and clothing will be offered. Friedman, Building 14, on Monday, Nov. 5 at 1 p.m.
mile east of the Florida Turnpike off Lake Worth Road). to Venice on the Gulf Coast for three days and two nights. Cocoa for three days and two nights. For trip and luncheon information contact Jeanette S.
Nov. 1, 8 p.m. at the home of Joan and Mike Schweitz. sales benefit the chapter. Guests are welcome. party at the Red Lobster on Nov. 28. Nov. 5, 12:30 p.m.,'at the Poinciana Lakes Clubhouse. should'be made out to Women's American ORT. formation, contact Bella Zatkowsky or Marcia Katz. A rummage sale will beL held or,'Sunday, Nov. 11. Beach Blvd. in Royal Palm Beach. offered from 9 a.m. to 4 p.m.
person or Miriam Korder, co-chairperson. Friday, Nov. 2, 9:30 a.m., at Woodlands Clubhouse No. Lorber, Phil Herman and Sam Finkenthal. that the client sees that week,"
I Gets its Zest from Chef Boy-ar-dee Ravioli. by ending all talk of even taking a penny away. the appointment of Ruth Goldman as its new manager. If no answer, please call the Center at 689-7700.
browse and pick up a bargain. Storytime and a movie festival. Chanukah gifts. Watch for further details. rtU. 79 DISTRICT 1 TO. POL ADV. Sunday, Nov. 11 at 10:30 a.m.
November 6 to keep her working for you. W. Pol. Adv. Paid lof by Eleanor Weinstock Campaign Fund. 881 fob done tor you. beginning Nov. 15 Cost $20. will be from Sparrow Drive. Austrian banks or bond issues. ment of the convention center. eration oj Palm Beach County. exercise class,' I told him. - which Center?' he asked me. 'What do you mean,' I said. on-line motor vehicle registration system. dollars is collected and distributed annually. in the Senate Caucus Room. key to peace is a strong Israel. [right], Israel's Ambassador to the U.S., looks on. ness to serve the Lord. a sin against the Lord forever. Stacey and Mark Levy and Dr.
transmitted to them," he said. Vander Walde. Cantor Mordecai Spektor. Daily: 8:30 a.m.
Beach 33406. Phone 433-5957. Rabbi Dr. Moms Suberman. 1869. Friday night serivces 8:15 p.m., Saturday. 9am. p.m. Daily services 8:15 a.m. and 6:J0 p.m.
TEMPLE BETH EL: 4600 Oleander Avenue, Fort Pierce. TEMPLE BETH SHALOM: St. Helen's Parish "au. TEMPLE ISRAEL: 1901 No. Flagler Dj-WJ. Cantor*! 5164 Okeechobee Blvd.. West-Palm Beach, FL *>*"
by calling the temple office. be a door prize and desserts. I and many other noted artists. ducted by Rabbi Avrom L.
day, Nov. 13, 12:30 p.m.
will be sold by their captains. by members of her committee. blending of their two lives. *n 'dsrstion of Palm Batch County. contributed to the final tally. with a caucus in Eilat on Sept. Ex-CIA Man Wants Nazi to Stay In U.S.
K Is by the United States. Israel's 15th 'Hanukka commemorative coins. You must reserves6y9fevemBef 1$, m4. sode at the rime of the Holocaust. lighted w ith the exhibition. Ehrlich and Shaw? They have good records." a/ t -:._-., Ilia mnvtrutinn in n n ..
rarely wrote of anything else. power and the struggle to live. often, out of his own experience. but I kept snapping my head up. suppose I was scared stiff." brushed Heller's teeth for him. was afraid he, too, would get it. the tip of Long Island. It! manent effect on his personality. know very little more now." the bank at Monte Carlo. accent. It's in his laugh. THAT ALSO holds true today. neighborhood to grow up in. than he, but less secure about it. we were kids," Winkler said. always knew he was a genius." terrified," said his sister Sylvia. the answers to her questions. though he was paying attention." Semitic I couldn't believe it"
beat the heck out of me." "I didn't like USC at all,"
at the age of 10." returned again to New York. I see a party more interested in party unity than uniting against what is right and just. I see a party that has failed to speak out strongly against the Russians treatment of its Jews and dissidents such as Sakharov. I find a Party and a President who speak out to the UN to stop its anti-American, anti-Israel, ant.-Semitic tirades. I find a Party and a President who are no. naive and gullible about the policies and plans of the Soviet Union. I find a Party and President who have consistently come to the aid of our mends and allies amund the world. I have examined the issues that are important to me and 1 know where I m going. This is a personally paid ad to express my personal reeling. he said, "was even more severe." interested in literature as I was. hair parted down the middle,"
was crazy. He could be grounded. sane ha had to fly them." our tent and go someplace else. We were human divining rods. we would drag into town with us. fusion and rage over Vietnam. and spend all his time writing. stay just about where he is. previous two only four years. vantage or with a new wrinkle. Moses than he did with him. BUT DAVID is also sad. rael, David is not a happy man. boy, did I cleave to her!" most modern readers of the Bible. of a second banana as David. good? Isn't it enough I'm God? he was already a grown man. Chosen People got a bum deal. anything about him. Go figure." his life. "I want my God back,"
Joseph Heller says J ? than he thinks, that there! burdened with accelerating medical costs. responsive to the needs of its people. imum term and your account is completely insured. ing you complete access to your funds at any time! It's that simple and convenient. Fox at City today. It could be your next "clever"
Fox TOTE BAG or CAP! Eretz Israel or other countries. come from a "first degree"
dom's skies in Eretz Israel. Szold and Lee Vassil groups. from Vero Beach to Homestead. Nov. 1st thru 7th. 1984. Auditorium Tuesday. Nov. 6, 9 a.m. to 4 p.m.
Friedman. Building 14. on Monday. Nov. 5 at 1 p.m. The general meeting will be held on Monday, Nov. 19. Children's Service will be introduced by Janet Asher. On Noi 26. 1 p.m.. at the Royal Palm Clubhouse. will observe ORT Sabbath at Temple Beth El on Nov. 9. Prints, personalized frames by Tia, children's clothing. The Lakes of Poiaciaaa Chapter will meet on Monday. Nov. 5, 12:30 p.m.. at the Poinciana Lakes Clubhouse. should be made out to Women's American ORT. DISTRICT 1 PO. POL ADV. Sunday, Nov. |] at 10:30 a.m.
Pd. Pol. Adv. Paid lof by Eleanor Weinstock Campaign Fund. 981 ** job done for you.